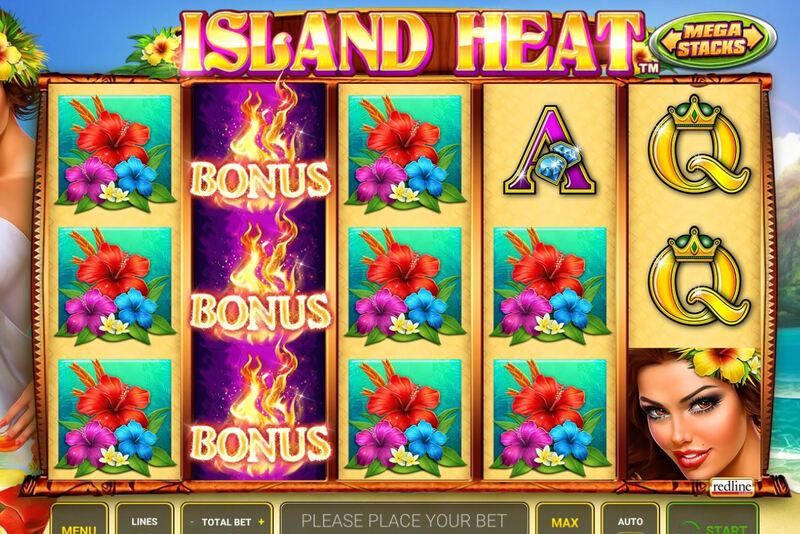 Island Heat slot by Novomatic tropical paradise with stacked wilds! 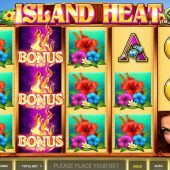 Island Heat slot by Novomatic is a pretty basic game although it has plenty of colour given it's tropical paradise theme and the setting of a Hawaiian island in the background. The expected music from the region plays as we spin and somehow sounds out of place when heard in conjunction with the harsh trotting sounds of the Novo reels. The tropical paradise theme is not uncommon with Play'n Go's Tropical Holiday, Yggdrasil's Spina Colada and Novomatic even managed to blend Elvis Presley into the subject with their pretty decent The Real King Aloha Hawaii. Can one of these colourful cocktails take a bit of the heat off our bankroll though? We have a simple layout of 3 rows on each of the 5 reels here with everything stacked, including the scatters as we'll get to shortly. Island Heat slot has 30 paying lines and you pay 30 coins to spin. The top pay is for 5-of-a-kind Wilds which are 1000 coins or 33.33x bet, Lady 50 coins, Dolphin 45, Parrot 40, Pineapples 30, Flowers 25 with four card values of 20 or 15 coins for a full line. What happens in the base game? Nothing aside from a super-stacked symbol being randomly chosen each spin, so let's move on to the bonus. You have stacked Flame scatters on all 3 centre reels and you need 7 in view for 8 spins, 8 in view for 16 spins and all 9 in view for 32. No retriggers here but you do tend to see the super stacks of higher symbol and Wilds more frequently. If you did get a full screen of Wilds it would pay you 1000x stake but really I expect this to be unlikely given the game's general appearance of a low-volatility model.